Revlon seemed to be a brand that had forced it’s way into hibernation on the British High Street. When I was younger it seemed to be everywhere but as I grew older, Revlon products became increasingly rare and their popularity dwindled. For this reason, it was always a brand I had overlooked. Recently however, their products have enjoyed a huge injection of popularity, becoming firm cult favorites with make up artists and beauty bloggers alike. Revlon have become hugely aware of trends and what I’ve grown to love is the fact that their colour ranges mirror colour trends seen at Fashion Week. 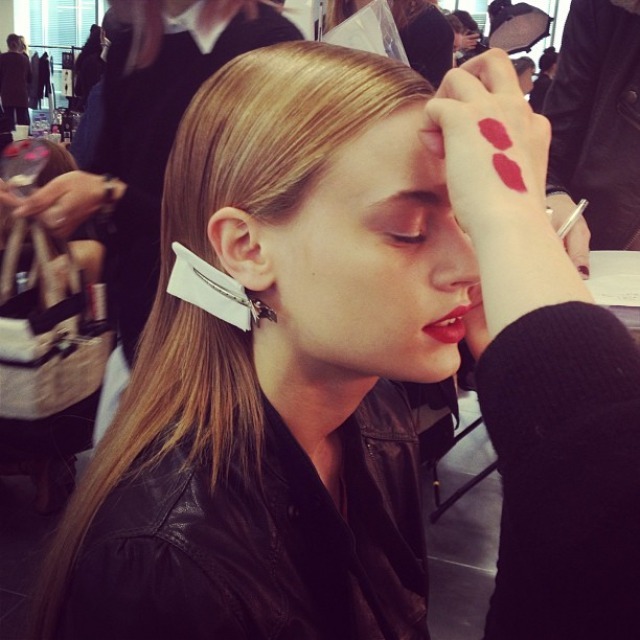 Gucci Westman, Revlon’s Global Artistic Director placed Revlon at the forefront of winning backstage looks by injecting a red tone at Antonio Berardi at London Fashion Week. It was one of my favorite looks and was created using Colourburst shades in ‘True Red’, ‘Kiss me Coral’ and ‘Shine City’ lipgloss. All brought together using the well-loved Colourstay palette in ‘Goddess’ with 3D volume mascara on the lashes. One of their stand out products for me, has to be the Photo Ready cream blush in ‘Coral Reef’. Their collection of cream blush are amazing as they work on a cream to powder formulation so are perfectly wearable on the skin. They are super easy to blend so if you’re a cream blush virgin these are perfect for beginners and wont be as intimidating as others on the market as they’re not too heavily pigmented. Hot on the heels of their beauty industry favourite Photo Ready, Revlon’s Nearly Naked is a product that has proven quite rare in it’s price range as it provides a light coverage. So many drug store brands champion a heavy coverage foundation and as I don’t like this, I tend to stay away. This verges on the side of a tinted moisturizer but has the perfect amount of pigmentation to give you an even coverage. It’s builable too, meaning you can achieve your desired coverage without it becoming too ‘cakey’. I’m hooked. What’s even more fantastic is the fact that you’re not restricted to a handful of shades, Revlon have created a range of 10 neutral shades with matching powders. It’s a lovely light and dewy everyday foundation. Revlon are back and they mean business. 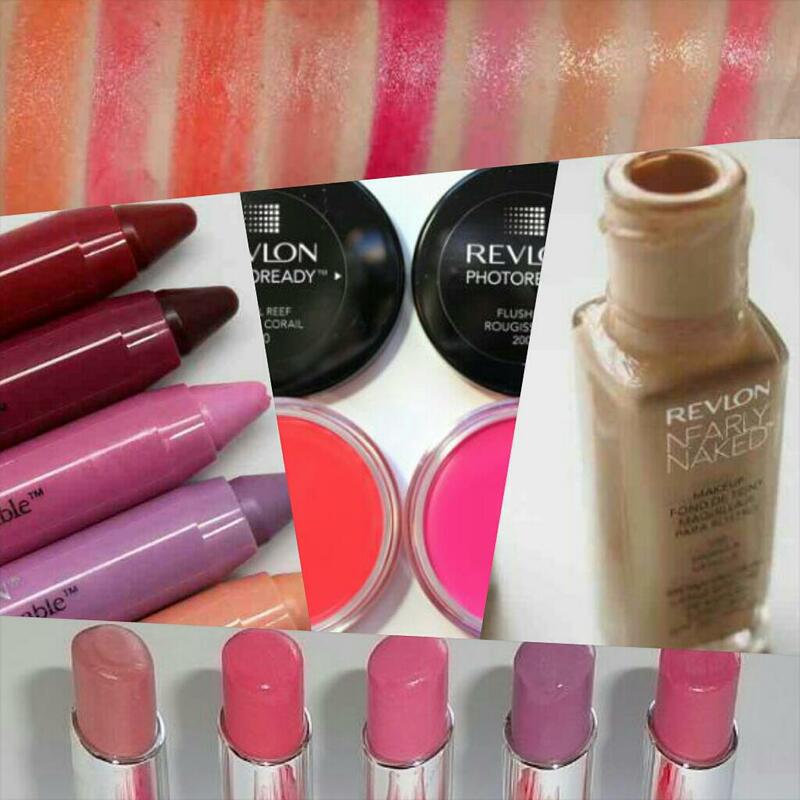 Revlon’s Just Bitten Kissable Balm Stains are perfect for the girl who just wants a subtle injection of colour on her lips. They’re not overly pigmented so if you want to experiment with colours but don’t want anything too dramatic then these are perfect. I used these on an event I was working on a few weeks ago and they were a hit with every woman I used them on. I also used the Colourburst lip butters which were also a winner as not only did they plump the lips with a gorgeous hint of colour, they also provided maximum hydration because they contain shea and coconut butter. They really do tick a lot of beauty lover boxes. A few weeks ago, I sent Chelsea Holland one of plainQUIRKY’s readers, a tube of Embryolisse to test. Her brief was simple, try it out for two weeks and write about exactly what she thought of it. It’s a product that has been a beauty staple for French women for years. Created by French dermatologists to work on every skin type, it has earned a well deserved reputation for being a miracle moisturiser. Embryolisse has hopped the pond and begun to convert us British beauty lovers to change-up our skin care routine. So, is Embryolisse all it’s cracked up to be? I’ve been using it for a month and I’m completely sold! Here, Chelsea gives her honest verdict…..
Well, what can I say? It wasn’t ‘love at first sight’ with this product as it’s packaging is quite bland, it was more like ‘love at first touch’. When I first saw Embryolisse in its packaging, I wasn’t very impressed but as the saying goes, never judge a book by its cover. When I first see a product, the packaging normally has to stand out to a certain extent. 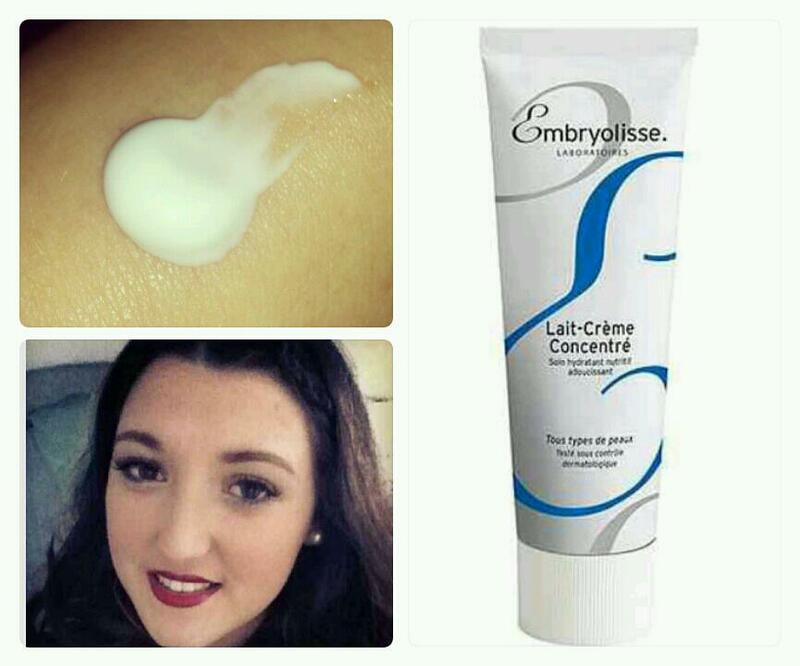 I would never have thought to try Embryolisse for this reason but after looking beyond this, I would have been missing out not to have tried this amazing product. The texture of Embryolisse isn’t too thick or too thin; it’s just perfect. My skin is a combination skin so I have to be careful where I put rich products as they can often cause more oil to be produced. When I first used Embryolisse, I thought I would try it all over my face, just after a bath and see how fast it would take to soak in as I don’t like anything that won’t soak into my face. As soon as I applied it, it started to disappear immediately and left nothing sat on my skin; I was sold! I have been looking for a product like this forever! As for using it under my make- up, I didn’t experiment much, as I was using this as a morning product before work to give my skin a nice glow. When I did use it as a base for my make-up, I used it around the side of my nose where I tend to have really dry skin from a cold and it worked wonders by not letting the make-up irritate my skin. I would definitely suggest this product to anybody, it’s amazing!!! I’ve been subscribed to GLOSSYBOX for a good few months now. It’s something I’ve known about for ages and would have had to have been living under a rock not to have heard of it, especially being a beauty blogger! So with this being said, I gave it plenty of time before I made my mind up about it. I continued to receive my monthly box of beauty products and I’ll have to be honest, I wasn’t bowled over by the brands and products. After all, the subscription is £10 a month and although I wasn’t expecting the world, I was however expecting more than samples of products I’d be able to get from a department store for free….. Plus with my first box, the contents of one of the products had leaked over the others. 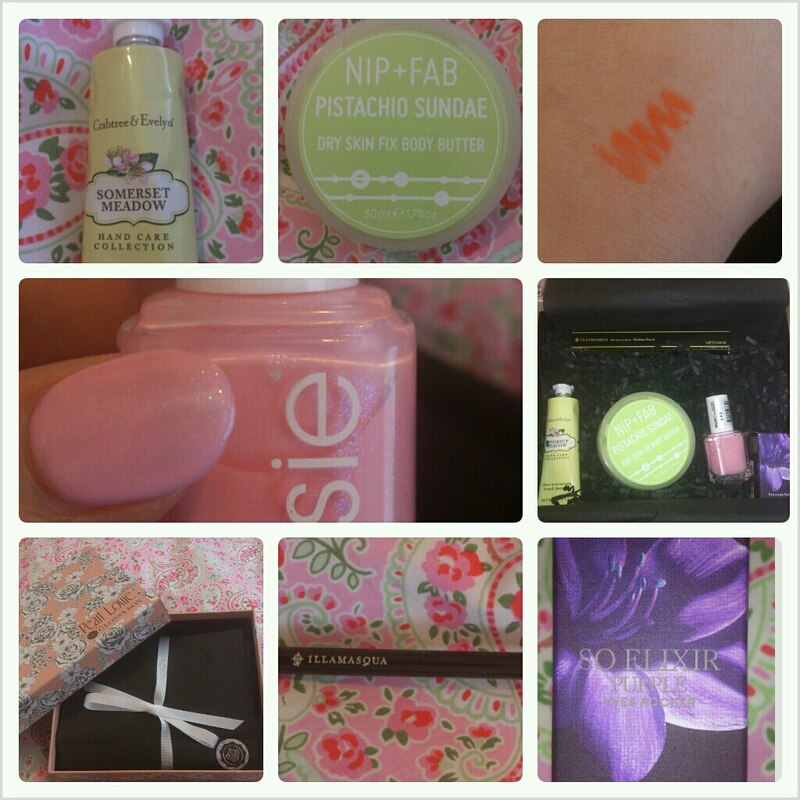 GLOSSYBOX wasn’t on the path to my good books! Initially, I loved the concept. A tailored box for you skin, hair and makeup preferences, chosen using the results of your multiple choice beauty profile. However, although this is great in theory, I’ve always felt like I had been sent the worst products from that month’s selection. For example, last month saw Elizabeth Arden’s 8 hour Cream which I love and Immortelle’s Precious Cream amongst the goodies on offer and I ended up with some hairspray and a MONU face mask that made my skin angry. So there I was, adament that when I’d received April’s box, I’d log into my account and cancel my subscription. What happened, however, is another story. It’s like GLOSSYBOX have this weird radar for when a customer is not satisfied, causing a box full of really great products to be sent out to keep you wanting more. You guessed it, I was sucked in again and for good reason. This month saw treats from one of my favourite makeup brands Illamasqua with a versatile medium pencil in ‘Thrash’. It’s the most gorgeous tangerine orange tone perfect for an edgy lip. Although suitable for the eye, I doubt I’m that brave! A cult classic Essie nail polish in ‘we’re in it together’, perfect for Spring with light reflecting glitter particles and the cutest pink tone. Crabtree & Evelyn ‘Somerset Meadow’ hand cream which is a great moisturizer but I’m not too keen on the smell! Along with the NIP + FAB ‘Pistachio Sundae’ body butter which is already one of my firm faves. The only product I didn’t like was the Yves Rocher perfume sample which turned my stomach as it smelt like an overly sweet version of mouthwash. All in all a crowd pleaser and a box which has made me question my subscription. For the moment, I’m going to give GLOSSYBOX the benefit of the doubt. Yes, they’ve sent me some garbage in the past (although I was impressed by December’s Seche nail polish!) I’ll be keeping my membership for another couple of months at least. Let’s hope I haven’t jinxed myself for next month! The jury is still out but for now, I’ll be here, enjoying my treats for April! I’ve been lucky enough to have been sent some things through from BeautyMART and have decided I’m going to do a monthly edit of my favourite products from what they have to offer. BeautyMART is something I’ve championed before. It’s a one stop shop for the products loved by industry insiders and is like shopping from the pages of Grazia or Vogue. However, instead of having to scour the high street, all the cult classics and latest well-loved products are in all one place! At the moment, I’m all about skin care. The dry cold weather has led to my face becoming chapped and blotchy and in need of a skincare SOS. There are so many mud masks out there promising to be the skin saviour I have been looking for but none that have worked quite like GLAMGLOW. Made with a mixture of volcanic rock, French sea clay and leaf pieces (stay with me, its much better than it sounds!) it’s a tingling knight in shining armour for sulking skin. I have to admit, when I first applied it I was unconvinced, the tingle was a bit alien but I stuck with it and the results were AMAZING. Soft, smooth and blackhead free skin. Not bad for 20 minutes work! Plus if it’s good enough for the likes of Jennifer Aniston and Natalie Portman then it’s good enough for little old me! I’ve talked about my love affair with Japanese skin care before and how DHC were some of my go – to products for distressed skin. I’ve used the oil (life saver) in the past but have always lived by the theory that using soap on your skin would make you shrivel up and die. OK, so I’m being dramatic but I’ve always approached skin soaps with caution. As I love DHC products so much, I threw caution to the wind and tried their Pure Soap. There they go again, creating a product I can now, not live without. It’s totally non-drying to the skin and because it contains fruit oils, its super nourishing for the skin. Winner! I’m a sucker for packaging, too! The mint gingham purse it comes in won me over too, with the product itself being an absolute keeper. All in all, BeautyMART have some incredible products and as they have been edited by beauty experts, you’re safe in the knowledge that these products actually work! Spring is finally here and with it, has followed fresh collections straight from SS13 Fashion Week. The ‘no make up’ trend has been massively popular, even seeing the ‘no mascara’ trend transcend into this coming Winter’s collections. To fully embrace this, Laura Mercier have released a spring collection bursting with neutral hues and dewy barely there pinks, lending a luxurious and ‘on trend’ colour palette for this season. With the release of 14 new shades of Creme Smooth lip colours from their ‘Girly’ pink of their warm ‘Belize’ burnt orange, there really is a shade to suit every skin tone. I love their highly pigmented formulas, rich with moisture. 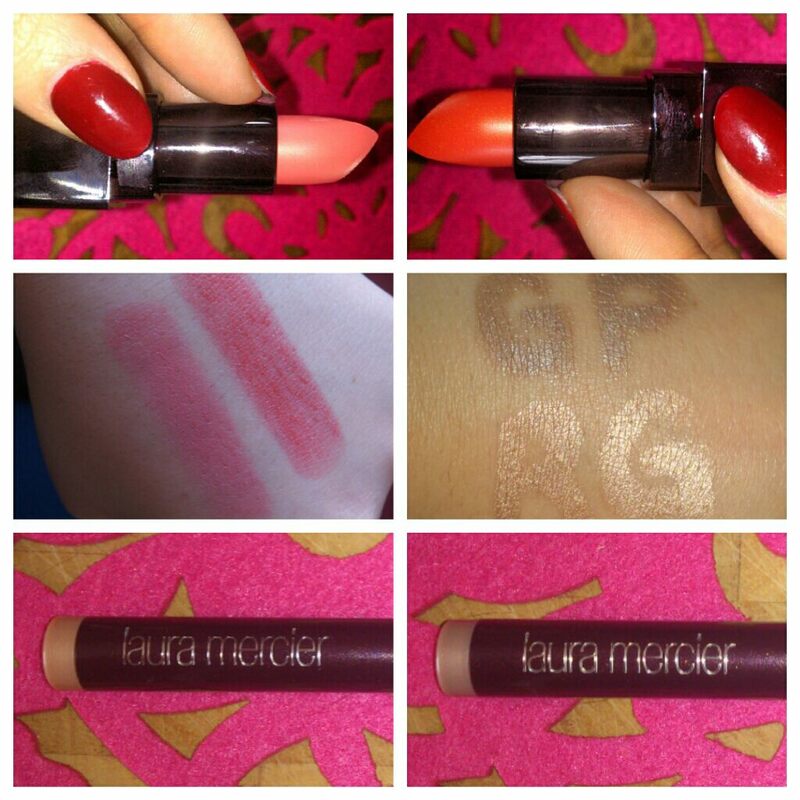 However, Laura Mercier packaging isn’t my favourite. I’m just being picky though, the products themselves really are heads and shoulders above other brands for their formulations and longevity, plus I’m a sucker for a satin finish! Sometimes its hard to find a satin finish lipstick without the consistency being too annoyingly sticky but these are perfect and well worth the investment. What’s more, they’re created with jojoba wax and pure olive oil to promote hydration and even application – isn’t this what all lipsticks should be like? Laura Mercier’s Caviar eye sticks are loved throughout beauty circles and it’s no wonder. The formula is such that creases are considered a naughty word and non-existent. The colour ‘Rose Gold’ is the perfect base for my skin tone as its light and appears dewy, in keeping with this seasons trend of a moisture rich complexion. I’d say though, that if you were a darker, more olive-skinned complexion, ‘Grey Pearl’ would be perfect. However I found this too dark for me. All in all these are the perfect shadow base. They have a brilliant colour payoff, enough to be worn alone and are so easily blendable. The collection really does have a colour for everyone but it’s the pastels I’ll be snapping up!